Everyone talks about them but few talk to them. That is my general view of how the vintelligentsia – the wine educators, the writers, the ‘gatekeepers’ — relate to consumers in China. And it is one reason our blog holds an annual wine contest called Grape Wall Challenge and asks consumers to be the judges. 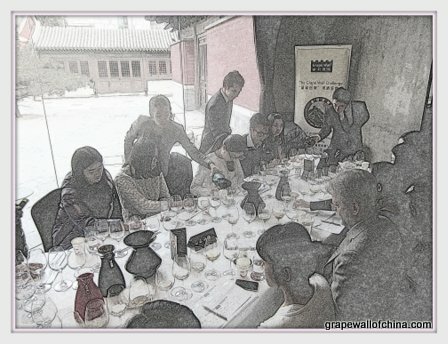 We held our fifth Grape Wall Challenge last Friday at Temple Restaurant Beijing. As usual, we asked “casual” Chinese consumers — those who enjoy and occasionally drink wine — to blind taste 21 bottles and rank each one as “love it”, “like it”, “dislike it” or “hate it”. This year, we focused on wines made in China. 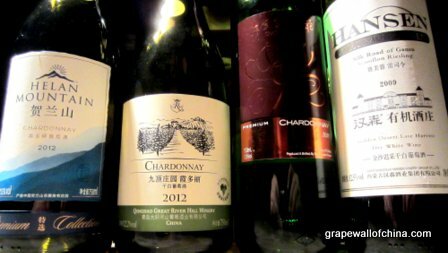 The consumers tasted eight reds and eight whites — arranged in flights of four wines — that retail for rmb150 or less. The wines are handled by retail outlets or well-known distributors with national reach, although they can still be hard to find. 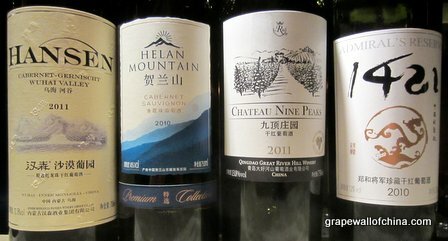 We also had a final flight of five wines priced from rmb199 to rmb790 so consumers could see what else is available. We informed them the last flight was more expensive. Before I get to the results and what we learned — or confirmed — two orders of business. One, this Grape Wall Challenge has five purposes. First, to see what wines consumers like, which means we keep scores. However, our sample size is small and bottles can vary – due to age, storage conditions, etc — so no one should read too much into one wine doing slightly better than another. Second, we seek value. There are some good Chinese wines that also carry very high prices. By focusing on wine at rmb150 or less, we are in a price range where most bottles are sold. Also, the trade price for these bottles makes them attractive to hotels, bars and restaurants as by-the-glass options. Thus, if we find wines that are universally liked, this is useful for the trade. Third, we want to know why consumers like some wines but not others. 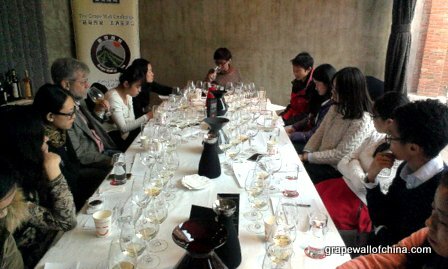 Professor Ma Huiqin of China Agricultural University, who has taught wine appreciation for over a decade, led a discussion with the consumers after each flight. Fourth, and arguably most important, we want consumers to feel confident when talking about wine. Most people can easily argue why they like a particular kind of pizza or Beijing duck, but wine tends to be intimidating — we hope to make it less so by making consumers judges. Fifth, tasting wine in a nice setting is a fun way to spend a Friday afternoon. Order of business number two: thank yous. To the judges for taking time to share their opinions. To Ignace Lecleir and the staff at Temple Restaurant Beijing for handling wine delivery and providing steadfast service – from pouring to taking photos to providing snacks – in stunning surroundings. We have been lucky to have the city’s top venues support our events, including F by Tribute (2012), Modo (2011), Maison Boulud (2010) and Maxim’s (2009), and this year is no exception. To the distributors for providing wine and showing faith that we will present their products fairly: China Wines and Spirits with Chateau Hansen, East Meets West with Great River Hill, Pernod Ricard with Helan Mountain, Torres with Grace Vineyard and Silver Heights, Wine Republic with Helan Qing Xue and 1421 Wines with 1421. And to Ma Huiqin — head of the table — who has been involved in the Grape Wall Challenge project from the start and led the discussions. Consumers liked the wines. 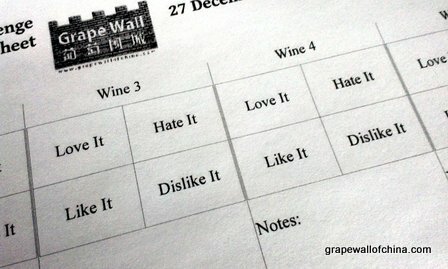 Of the 16 wines priced at rmb150 or less, only four had fewer “like/love” votes than “dislike/hate” votes. That means 12 of 16 averaged over the “like” line, though some only marginally so. The most likes/loves went to Grace Chardonnay with 11 votes (11 likes). The runners-up, with 10 votes each, were Grace ‘Premium’ Chardonnay (4 loves, 6 likes) and Helan Mountain ‘Premium’ Cabernet Sauvignon (1 love, 9 likes). Although red wine dominates the market, especially in the massive gift-giving and entertainment segments, the situation is different when it comes to taste. Our Grape Wall Challenges and other taste tests have seen white wines do well and often beat reds. On Friday, I asked the consumers if they enjoyed the first flight of whites or the first flight of reds better — almost all chose the former. Also, looking at the scores, there was a much bigger range between top and bottom for the white wines, with consumers finding the white wines easier to distinguish and the red wines more homogenous. Ma also noted, “Sweetness in aroma is appreciated, that is why several people like the Hansen Riesling-Semillon [which smells like a harvest wine but is dry].” This extends to a sense of sweetness in taste, usually due to ripe fruit, even when a wine is dry. 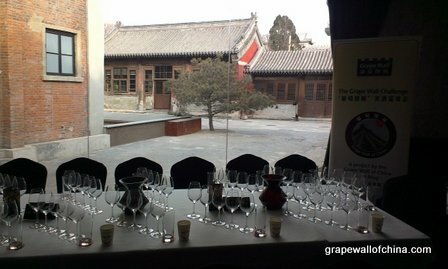 Finally, in terms of wines priced over rmb150, the scores were significantly higher. All five wines had at least 11 votes for “like” or “love” out of 13 votes. Two wines were universally liked/loved: Helan Mountain Special Reserve Chardonnay (5 loves, 8 likes) and Helan Qing Xue Jia Bei Lan (5 loves, 8 likes). And what of love? The rmb150 or lower wines with the most: Grace Premium Chardonnay and Great River Hill Cabernet Sauvignon with four votes each. In the final flight of more expensive wines, the most-loved one was Silver Heights ‘Family Reserve’ with seven votes. Here are the wines, with region, price and distributor in brackets. I want to get this up before heading out for New Year’s Eve celebrations tonight but will be back in early 2014 with details on how to get these wines and some more observations on the Grape Wall Challenge. All of the wines in this flight had at least six likes out of 12 votes. Grace Chardonnay has the most loves (three) and likes (eight), while each of the 1421 wines had two loves. 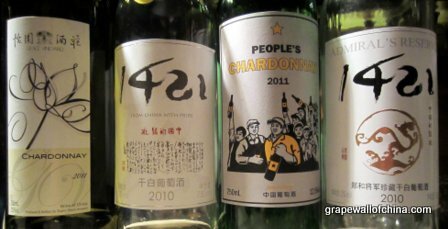 One person “loved the nose” of the Grace “People’s” Chardonnay while another described the 1421 “Silver” Chardonnay as “smells light but tastes refreshing”. Again, all wines finished with at least six loves/likes out of 13 votes. Grace Premium Chardonnay led with 10 votes — four loves and six likes. Both Helan Mountain and Great River Hill wines received two loves. And while no one loved the Hansen Riesling-Semillon, it received more likes — seven — than any entry except Grace. People described it as “unique”, “flowery” and “special” as it smelled like a harvest wine but is dry. For Great River Hill, one person stated that it is “ideal for summer”. The scores were close in this flight, especially among Grace Cabernet-Merlot (one love, eight likes), Grace People’s Series (one love, seven like) and Helan Mountain Merlot (one love, six like), with 1421 getting five likes. Every wine in this flight received at least seven loves/likes. Helan Mountain led with 10 (1 love, 9 likes), followed by Great River Hill with eight and Hansen and 1421 with seven. Great River Hill received the most love with four votes. These five wines were almost universally liked/loved. The Chardonnays from Grace (5 loves, 7 likes) and Helan Mountain (5 loves, 8 likes) presented contrasting styles but were enjoyed by almost everyone. With the reds, Helan Qing Xue received the most votes with 13 (5 loves, 8 likes) followed by Helan Mountain (3 loves, 9 likes) and Silver Heights (7 loves, 4 likes). Silver Heights received the most love with 7 votes. That is all I have for now since, as mentioned, I want to get this posted before New Year’s Eve! I will be back soon with more on these wines and this contest. Again, thank you to everyone involved in this project. And happy New Year!